Valentine day is always a great day for people to express their love in a unique way. The use of Valentine’s card has always been a great way to pour out our love and express how we feel about those we cherish and hold dear to us. However, these cards can at times fail us and not give us the exact words that we need to express how we feel and make our friends and loved ones know how special they are to us. 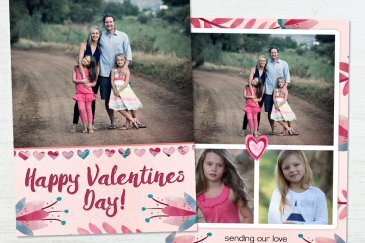 The use of Valentine Card Templates gives us a powerful tool to tell everything just as it is and even makes it more decorative by the use of personal images. You can use some of the most unique and easy-to-use templates to create your own cards or do so for your clients in a way that brings money to your business. The most notable thing about these templates is that they can be used for all genders and age groups thus making them unique and worth a thought. Each of these templates is designed for Adobe Photoshop and works with Mac and Windows. Just grab one for yourself and enjoy doing the final touches in an easy and unique way. The beauty and fragrance of roses can never be wrong on valentine day. In the same way, your card will always be on point when designed using floral Bloom. This is a colorful valentine card template that guarantees you some exceptional results yet you to not need to spend more than 5 minutes doing your personalization. The template comes with some easy to use tools including clipping masks which will be great as you add your images. Whether you are adding a picture of a bunch of roses or the actual images of the lovebirds, clipping masks will help make your work easier and faster as you only need to drag and drop them on the canvas. You will also be able to resize the images in a single step and everything remains precise and smooth. This template for valentine cards has a dimension of 13 by 18 centimeters which are an ideal size for cute cards that can be placed anywhere in the office desk or at home. You can earn money using this template or just market your business and see your clientele grow tremendously. Just download the template and enjoy designing your cards anywhere without relying on the internet. Who has ever hated a hug on any given day especially on Valentine’s Day? With this template, you can send the warm greetings of love and let your loved ones know how much you care about them and that they mean the world to you. This Valentine Card template comes with a sweet sprinkle of cute heart shapes which will definitely help tell your story and express your heart in a way no other card could. You can fully edit the text to put your heart into words and share it with a smile on your face. Hug Me is designed for Photoshop and works with Photoshop Elements 6+, Photoshop CC and Photoshop CS+. It can be edited in either Mac or Windows without any hassles. With the download, you’ll receive a list of font names which you can use in your editing work plus some instructions to help you get started. 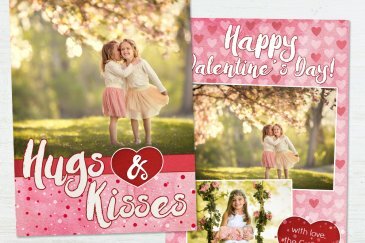 The 13 by 18 centimeter template is easy to use and even people without any graphic design skills can customize it within a matter of minutes and come up with their own adorable Valentine’s Day cards. Send those hugs and kisses in a special way and let love fill the air with the help of this lovely Valentine card template from Sleeklens. Sleek Elegance as the name suggests is a combination of adorable style and soft touch that will bring a smile to anyone you give your cards to. There is no doubt that everyone wants to feel loved and expressing it in a special way definitely helps drive the point home. You can do it using your own choice words thanks to this customizable 13 by 18 centimeter template which allows you to note only edit the text fully but also add your own images. As a professional photographer, this template will make for a great addition to your studio tools and you can use it to make more money for yourself. You can design adorable cards for your clients using their own photographs and words spoken from deep within their hearts. You can also use the template to send special Valentine Day greetings to your supportive clients and let them know how much you care about their happiness. The template comes in Layered Photoshop (psd) files of 300 dpi and offers you some easy to use tools such as clipping masks. You can use the clipping masks to drag and drop your images onto the template and even resize them to fit perfectly within the given space without making them shoddy and unpleasant. This lovely template has cute background effects which guarantee colorful and high-resolution results. 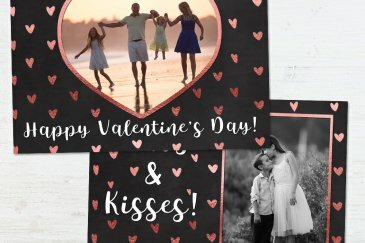 You can use these Valentine Card Templates to come up with brand new cards every year while maintaining their uniqueness all through. The templates are available at a truly standardized price and you do not have to pay for any subscription in order to use them. The one-time payment gives you access to powerful tools you can use not only to spread the pleasant aroma of love but also give exposure to your photography business in a remarkable way.